The "Yarin Shahaf" school allows you to realize a dream, to work in a field you always wanted and enjoy every moment! This is exactly the place to know and learn everything about beauty. The school was founded in 1986 and from then turned into the no.1 leading school in Israel for beauty professions. In its professional hugging walls you will find a whole world of beauty studies and a team that train the best makeup artist in Israel. The "Yarin Shahaf" school continues to be face forward. The advantage and uniqueness of the school is not only what's in it, even though it has allot. The professionalism is expressed also in that the school does not have a makeup line so does not transgress into commercialization or lack of objectivity. This is reflected during makeup studies where the students are exposed to different kinds of products and techniques and the different consultations and makeup services that the school offers. Yarin Shahaf said it well: "It's only teaching, and in teaching we are no.1". Yarin Shahaf, known today as the leading makeup artist in Israel, was born in Tel Aviv in 1962. His love for makeup started early on in his life. As a youngster he went to a trip to Italy and discovered a whole fascinating world of professional makeup. It all started on a train ride from Rome to Florence, where he met two makeup artists and the enchanting conversation with them filled him with enthusiasm. That same enthusiasm follows him today in all his steps at the top of the makeup world. During his job, Yarin Shahaf gave many lectures and that's how he found his teaching talent in general and makeup teaching talent in particular. This paved the road to a unique professional career. In 1986 Yarin Shahaf founded the makeup school. His main job is training professional makeup artists in the different makeup areas: beauty makeup, brides, photo shoots, television, artistic makeup, film and theatre. Since then, he worked in countless fashion shoots and clips, makeup for known magazine covers in Israel and abroad, worked in commercials for big companies and is a personal makeup artist to many models, actors and singers. Yarin provides his students with the vast knowledge and experience he accumulated and his connections in the film, theater and fashion industry in Israel. Yarin also simulates injuries for trauma courses at the medical faculty of Beer Sheva University and is the lead makeup artist for the army's medical corp. In 1999 Yarin Shahaf got magical proposal, to be the lead international makeup artist for one of the biggest makeup companies in the world, although the financial temptation, Yarin decided to continue in his way and train a new generation of makeup artists in Israel. Yarin Shahaf is registered in three prestigious makeup agencies in Europe, though them he goes every October to Milan and Paris to do makeup in the Prete a Porter summer makeup shows and in March for winter shows. Yarin does makeup for Haute Couture fashion shows in Paris in July (winter fashion) and January (summer fashion). In addition, he teaches several times a year at the Make-up institute Stockholm in Sweden. From 2014 Yarin is involved, with other trendologists from around the world, in forecasting the future and trying to "read" trends in the beauty world before they happen. In July 2016 Yarin Shahaf launched the trends magazine for 2017/18 in Israel and Europe. In cooperation with leading cosmetic chemists Yarin Shahaf is involved in developing and improving professional makeup products. At the same time he advises many cosmetic companies on color choice and ingredients that improve the product. The professional satisfaction that he gets from advising and developing professional makeup brought him to the decision not to develop his own professional line, so he can continue been a neutral adviser without focusing on a specific company. At the same time, he make sure his students will study and practice makeup without representing a specific company. Yarin Shahaf founded the school in 1986 when he was only 24. He started at Ben-Gurion Boulevard with only one class. Who could have predicted the development…? In 1987, without wasting time, the school moved to 84 Dizengoff Street where he met his wife Nava. 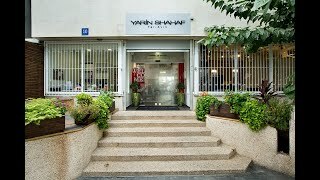 Another year went by and in 1988 "Yarin Shahaf" makeup school changed address to 58 Arlozorov Street. The premises had two classes for makeup studies and a studio for the students to photograph their work. Yarin started hiring more teachers to teach more and more students registering to the school. In 1997 the "Yarin Shahaf" school to 26 Mapu Street, Tel Aviv. In 2011 the school moves to 7 Mendale Street, Tel Aviv. The selection of courses expanded to other beauty areas like styling, hair etc. Thinking of the students welfare, in 2015, the most magnificent makeup school in Israel opened, a new, five story building In 10 Beit Hillel Street in Tel Aviv. The school is in walking distance from Ha-Shalom train station and Azrielli Center. The school has well equipped spacious makeup classes, Photography and television studios, a library, inspiration rooms, a makeup shop, art gallery, cafeteria and more. Yarin comes from a religious family, but lives a secular lifestyle that suits his profession, while respecting religion and his family's choice. After founding the makeup school started a family too, and married Nava. The couple have two daughters.